Mom and I have a lot of fun playing and pretending. 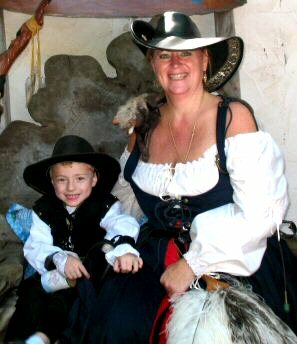 We love going to our local Renaissance Fairs and dressing up in costume as Pirates. I saw a commercial for Wizard101 on tv and asked Momma if we could play. A couple of days later after she checked it out, we began playing. I was 6, I’m almost 10 now. I love playing with my Mom and I love how she loves the game as much as I do. (Maybe more). Now Mom is minister, teacher and author. She’s also a retired Information Technology geek. Which is why we have a lot of websites and blogs. She writes a lot of articles for other people, so when I asked if we could have a blog for “our” game she said yes. Woohoo! And she created our blog for Wizard101 called Victoria Fireheart’s Keep. Now we’re excited about Pirate101 and we’ve even gotten my Dad into playing with us! We enjoy sharing what we learn through playing the game! She says I’m not old enough to write on the blog yet, which is a bummer. But she lets me give her suggestions and sometimes she types up what I want to say and share. I can’t wait till I can post on our blogs too. We hope you enjoy our home for scurvy Pirates here on A Pirate’s Portal!